Salvo, NC, is the quietest of the three villages of Rodanthe/Waves/Salvo, known locally as the Tri-Villages. Salvo is predominantly residential and perfect for a quiet vacation. Originally known as Clarks or Clarksville, this village’s name was changed to Salvo, NC, when the post office was opened here in 1901. There’s a legend as to how the name Salvo came about. It’s said that a Union ship proceeding north from Fort Hatteras sailed by this village during the Civil War and that the commander of the ship inquired about its name. He was informed that the village had no name on the Union charts. The commander reportedly told the assistant to “give it a salvo (a firing of the cannon) anyway,” and the name Salvo was marked onto the Union charts. The name was apparently perpetuated on other maps as well so that when the postal service was looking for a name other than South Rodanthe, it chose Salvo, NC. Gull Shoal Life-Saving Station was located in Salvo from 1878 to 1940 and was known for many heroic rescues, especially when Rasmus Midgett single-handedly rescued 10 people from the sinking Priscilla in 1899. Though Salvo, NC, has grown like every other area of the Outer Banks over the past few decades, it hasn’t really lost its center. Salvo of present day feels a whole lot like the Salvo of three decades ago. Sure, there are more vacation rental houses, but they’re generally in keeping with the size and scale of the village. Yes, there is more Salvo shopping now than 30 years ago, but these places, too, remind you of the mom and pops that kept locals and visitors satisfied way back then. The Salvo restaurant scene hasn’t changed much at all; unless you’re looking for ice cream or something quick from The Blue Whale, you head a few miles south or north to other Hatteras Island towns. The real focus is Salvo recreation — water sports and outfitters, car and jeep rentals, fishing and, of course, the wide-open beaches. If your perfect getaway from life's hustle and bustle is to come to a relatively remote beach town where the focus of activity is on the water, Salvo is the place for you. Salvo's things to do are all about the ocean and sound. Two water sports outfitters are here, and you can rent Waverunners, Jet skis, sailboats, SUPs and kayaks and surfboards and take lessons in surfing and paddleboarding. You can also hang out on the sound in Salvo with two specific places with parking. The sound waters are much calmer and more shallow than the ocean, so many families with small children find this a better option. Another popular thing to do in Salvo is to rent Jeeps and cruise on the beach. But make sure you get a permit and are aware what areas of the beach are open for such activity. Of course, many people come to this laid back town to simply spend a quiet week on the beach sunning, strolling, shelling and relaxing. Sounds like heaven. The Salvo, NC, shopping experience proves that you don't have to have tons of options to get what you need. In the almost 1-square-mile town, there are two sports-related outlets that carry equipment, clothing and accessories, a fantastic art gallery housed in an historic life-saving station and two convenience stores that are so well-stocked that most your basics are covered: souvenirs, rods and reels, bait, t-shirts and other clothing, a surprising variety of beer brands and good wines, snacks, hot sauces and bbq sauces, gourmet coffee, beach supplies, firewood, propane, books and magazines, boogie boards, and ATM and more. One of them is also an official weigh station for your catches and sells NC fishing licenses. Sure, to do your big grocery shopping or purchase the latest fashion bikini, you'll need to head to Avon, but that's only about a 15-minute drive. As we said, Salvo is the quietest of the Hatteras Island villages, and as such there's no real Salvo restaurant. You can get simple snacks at the two convenience/tackle stores in town. But the several-minute drive to Rodanthe or Waves to grab a bite is not a hindrance. There is an ice cream shop . . . and plenty of people are happy to consider that cold treat a meal! The only Salvo, NC, hotel is actually a campground that opened in 2013. It has 16 sites that offer sewage, water and 30 and 50 amp hookups. There's a nice bathhouse and easy beach access. 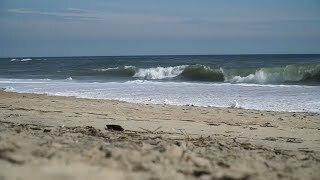 Where is Salvo, NC's, location on the Outer Banks? 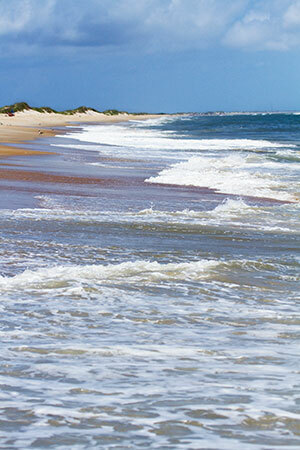 Salvo, NC, is the third village you'll get to as you drive south on Hatteras Island. From the Herbert C. Bonner Bridge, it's about a 20-minute drive to Salvo, but on the way you pass through Pea Island Wildlife Refuge, Rodanthe and Waves. These three small towns are known as the Tri-Villages, and visitors will probably not know when they've left one and entered the next since they're only a few miles apart. Hatteras Island is south of Nags Head. Are there vacation rental houses in Salvo? Since there's only one campground in Salvo, the rental houses are the vacationers' option. One good thing about vacation rentals in this area is that there are still affordable ones to choose from, and the styles range from simple, older properties without a lot of bells and whistles to relatively new houses with plenty of amenities. What's the word on the new bridge being built over Oregon Inlet? The bridge to replace the Bonner Bridge, which was built in 1963, is under construction and scheduled to open in the fall of 2018. It will greatly help to make Hatteras Island more accessible as it will bypass part of the highway just north of Rodanthe that often becomes impassable during storms. The rise of the bridge will be 20 feet higher than the current one, and each lane will be 12 feet wide with an 8-foot shoulder. The engineers who designed the bridge put it through more than 100,000 simulations of the worst storms to hit the Outer Banks over the past 160 years and even accounted for a dredge slamming into it (which happened on October 26, 1990, causing a 350-foot span of the bridge to drop into Oregon Inlet and left Hatteras and Ocracoke cut off for more than three months). They say this bridge is built to last a century. What's the weather like in Salvo, NC? Who doesn't like the weather in Salvo, NC? There's nothing to not like since the summer temperatures are usually hot (but not HOT) and the winter temperatures are moderate. Plus, the constant winds in summer help you feel cooler, and the frequent afternoon thunderstorms during the hot months drop the temps too. Every now and then, there's even a little snow here in winter that lasts a day or so then melts away. The warm waters that sandwich Salvo keep it slightly warmer into the fall and slightly cooler into the spring than the middle part of the state.